Tiz McNamara’s music has been streamed more than 2 million times online. This impressive feat is even more incredible when you discover he has done so single handedly with no management, label or PR backing. The Cork native has caused quite a stir on the international folk scene as his music has been championed by the likes of Dermot O’Leary (BBC Radio 2), Gabby Roslin (BBC London) as well as several ‘Amazing Radio’ Djs. In 2013 Tiz’s talent afforded him the opportunity to sing on a UK No.1 Christmas single with Sir.Paul McCartney, Robbie Williams, and Shane McGowan. Since then Tiz has released several of his own tracks, each being received incredibly well from both industry professionals and the public alike. Tiz debut single ‘Steady as you Go’ has appeared on Uk TV shows ‘Hollyoaks’, ‘Emmerdale’ and ‘East-Enders’. 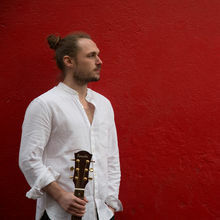 The Irishman has also built a name as being a fantastic live act and has spent much of the past two years touring Ireland and the UK and more recently Europe. In the past Tiz has supported the like of James Bay (Critics Choice winner, Brit Awards) as well as Frances and Australian folk band Oh Pep! “Rarely has an EP given off such prominent real love, until greeted with this radiant bestowal; truly mind-altering.” –, Liverpool Echo(EP review). “Wow, I don’t know what to say, it’s hard to find any words when something over powers you like that, amazing. I am so glad you starting writing songs” – Gaby Roslin, BBC London.